string(1157) "Resource Centre > Uncategorized > Interactive Map for Business of Anti-Human Trafficking Organisations"
With 75 organisations and initiatives included, who are working on five human-trafficking-related issues (child labour, forced labour, etc. ), covering eleven industries and eight regions, the Interactive Map aims to improve coordination on the eradication of modern slavery, and provides a unique baseline from which existing and newly formed initiatives can move forward. If you are a first-time user, there is an option to take the tutorial on the Homepage. The user can select a dimension among the four categories to start with their search. 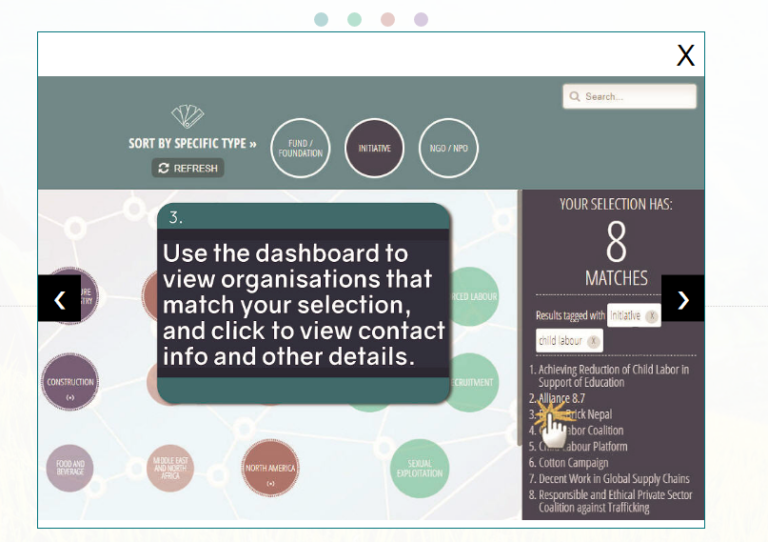 Once a category and its specific sub-category is selected, the map will show a general overview/ landscape of the initiatives and/or organisations matched the respective selection. Clicking on the icon on top left hand side will show more information about the Map, including the collaborating organisations, the Map’s methodology, scope and typology, as well as the option to download the raw data used. 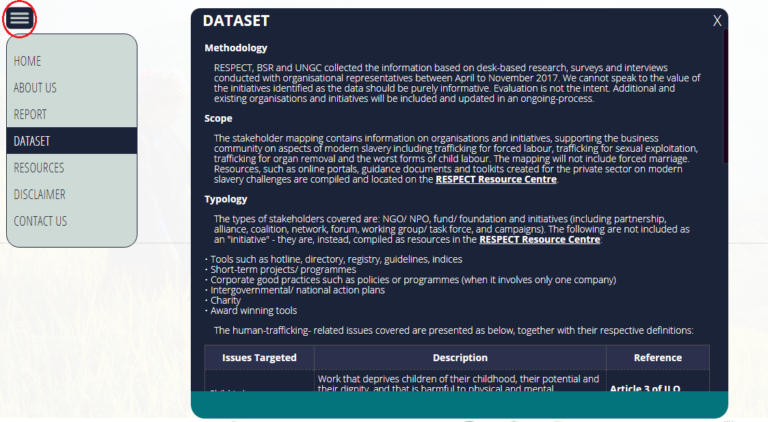 Should you have any questions regarding the project, data or methodology or know a relevant initiative and/or organisation which works with the private sector and on human trafficking issues, but is not yet included in our data, please write to contact@modernslaverymap.org.